Explanation: in 1972 my family lived in Papua New Guinea. These are some of the old slides from that time scanned in for safe keeping. Dates and times: Howard (my dad) and Virginia (my mother) and daughter Cheryl (my sister) left for Washington DC for a week of Howard's orientation on January 1, 1972, then to two weeks of further orientation at UNESCO headquarters in Paris, France. Then to PNG (Papua New Guinea) about mid January '72. Howard's mother Erma (my Grandma) brought Randy (my brother) and Brian (me) directly to PNG, mid February '72. We left PNG in September 1973. 60 Best Pictures - a selection of pictures for an hour long slide show from Papua New Guinea in 1972. Family Pictures - from around our house in Goroka, Papua New Guinea in 1972. Goroka Pictures - Goroka Market, Goroka Natives, Pikininis, Maris, etc! from Papua New Guinea in 1972. 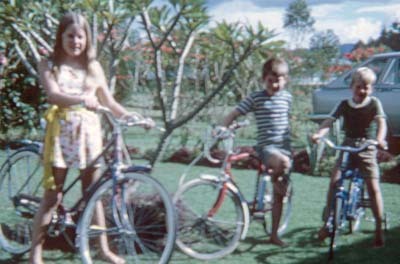 Madang Pictures - We vacationed in Madang, Papua New Guinea, in 1972. Very scenic coastal town.